Back in the heyday of drive-ins and sock hops, a 23-year-old Elvis Presley was dominating the music scene with an unprecedented string of 10 consecutive #1 hits. It was exactly 60 years ago when the handsome crooner from Tupelo, Miss., tried for number 11 with his sure winner, "Wear My Ring Around Your Neck." Welcome to Music Friday when we like to bring you fun, throwback tunes with jewelry, gemstones or precious metals in the title or lyrics. In today's song, Presley wants his girlfriend to wear his ring around her neck. Of course, the ring would be on a chain — as was the custom in the 1950s — to signify they are going steady. No doubt, countless teen girls in the spring of 1958 imagined The King was singing to them. Here's the first verse: "Won't you wear my ring around your neck / To tell the world I'm yours, by heck / Let them see your love for me / And let them see by the ring around your neck." Written by Bert Carroll and Russell Moody, "Wear My Ring Around Your Neck" was a big hit, but stalled at #2 on the U.S. Billboard Hot 100 chart, narrowly breaking Presley's string of #1s. 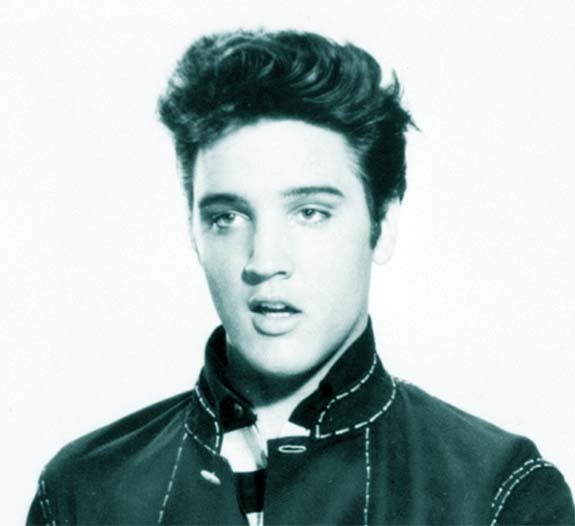 All 10 of Presley's previous chart-toppers had been released during a two-year period. Born in 1935, Elvis Aron Presley ascended to stardom in the mid-1950s with his good looks, silky voice and outrageous performance style. Not only did he top the charts during the 1950s and 1960s, but he also starred in more than 30 movies, including Jailhouse Rock (1957) and Viva Las Vegas (1964). Presley met Priscilla Ann Beaulieu in 1960 and married her after a seven-and-a-half-year courtship. Presley proposed with a 3-carat diamond ring in December 1966 and the wedding ceremony took place one year later at the Aladdin hotel in Las Vegas. The King, as he was known, would eventually become one of the most influential artists of the 20th century. His first performance on the Ed Sullivan Show in September 1956 was watched by a record 82.6% of the nationwide viewing audience. Presley is the best-selling solo artist in the history of recorded music, with more than 600 million records sold worldwide. His Memphis home, Graceland, is still a major tourist attraction. Presley died in Memphis on August 16, 1977, at the age of 42. Written by Bert Carroll and Russell Moody. Performed by Elvis Presley. In 1954, Maria Martha Hacker Rocha, a statuesque beauty from Brazil, was the odds-on favorite to win the Miss Universe pageant. Admirers from all over the world were captivated by her beauty, class and amazing blue eyes. 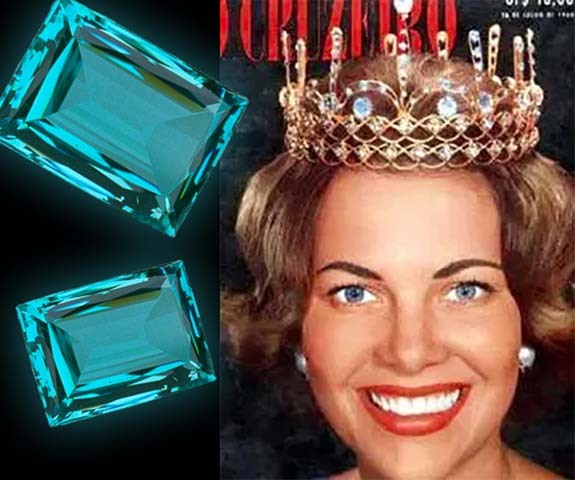 Although she eventually earned runner-up status to American Miriam Stevenson, the 18-year-old from the Brazilian state of Bahia would be forever linked to the world of fine jewelry and March's brilliant blue birthstone — the aquamarine. About the same time as Rocha was competing on the world stage, an incredible aquamarine crystal was found on a farm near Teofilo Otoni, Brazil. It weighed approximately 74.5 pounds and the color was so rich, so intense that the Brazilian gem dealers needed to distinguish it from the rest. But the 74.5 pound specimen was in a class by itself. They decided to name it “Martha Rocha” as a tribute to the Brazilian beauty queen with the captivating clear blue eyes. Even today, gem experts use “Martha Rocha” as a classification of tone and intensity when rating the finest-color aquamarines. At 81 years old, Rocha is still a symbol of beauty in Brazil, and she has streets named after her in Bahia, Santa Catarina and São Paulo. Aquamarines are mined in many countries, including Nigeria, Madagascar, Zambia, Pakistan, Mozambique and the U.S., but many of the finest-quality gemstones still come from Brazil. Credits: Martha Rocha on the cover of Brazilian illustrated weekly magazine O Cruzeiro (August 1954); Gem photos courtesy of Smithsonian/Chip Clark. 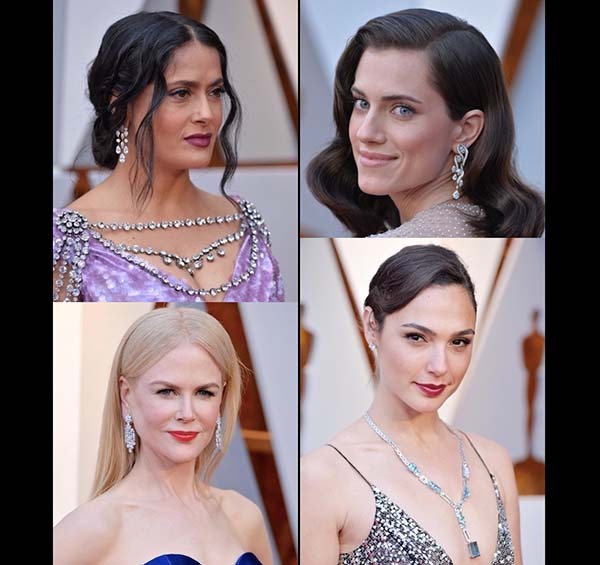 Hollywood’s most talented and glamorous stars celebrated their achievements wearing platinum jewelry at the 90th Academy Awards in the City of Angels on Sunday night. According to insiders, jewelry houses called in designs from around the globe and arranged high-security hand-offs to the stylists who dressed the red carpet-ready A-listers. Platinum chic is often the choice for celebrities, and this year’s Oscars did not disappoint. Cluster chandelier earrings and magnificent statement rings set in cool platinum were among the dramatic, spotlight-grabbing baubles. Nominees, performers and presenters alike accentuated their designer gowns with bold, platinum-set looks that were nothing short of Hollywood glam. • Allison Janney, who took home the Oscar for Best Supporting Actress for her role in I, Tonya, wore a Forevermark by Rahaminov Diamond Riviera Necklace set in platinum, 55.26 ctw; Forevermark Exceptional Diamond Asscher Ring with side baguettes set in platinum, 18.10 ctw; Forevermark by Rahaminov diamond line bracelet set in platinum, 27.02 ctw; and Forevermark by Premier Gem round brilliant diamond studs set in platinum, 11.13 ctw. • Nicole Kidman, a presenter, wore 84 carats of Harry Winston diamonds, all set in platinum – including Winston cluster diamond chandelier earrings (23.52 carats), Secret Cluster diamond bracelet (37.62 carats), Tulip Diamond Bracelet (12.86 carats), round brilliant diamond cluster ring (4.73 carats), and an oval-shaped diamond Rock Band (5.5 carats). 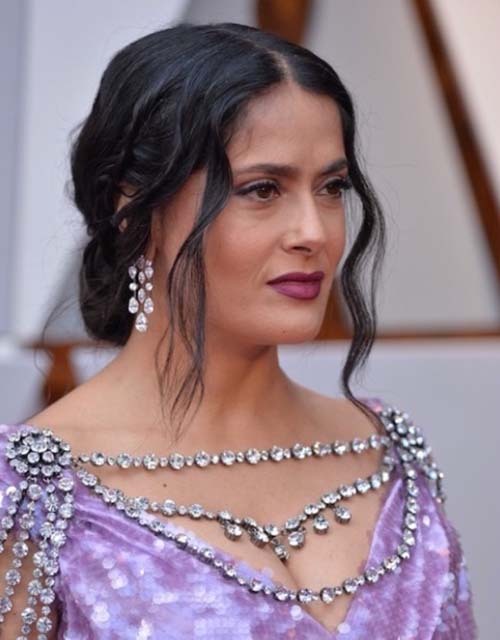 • Salma Hayek, a presenter, wore Harry Winston earrings with diamonds, and a ring with an oval-shaped diamond, both set in platinum. • Gal Gadot, in platinum by Tiffany & Co., wore diamond earrings, a Tiffany Blue Book Collection necklace with aquamarines and diamonds, and a Tiffany Blue Book Collection ring with a aquamarine and diamonds, all set in platinum. • Greta Gerwig, double nominee for Lady Bird (Director and Original Screenplay), wore platinum by Tiffany & Co. – a necklace with diamonds, sapphires and moonstones circa 1910-1920, set in platinum; earrings with diamonds, set in platinum (priced at $29,600); 2018 Extraordinary Colors of Tiffany Collection ring with an esteemed sapphire (approximately 5 carats) and diamonds. • Saoirse Ronan, nominee for Best Actress for Lady Bird turned heads in Cartier High Jewelry sapphire and diamond drop earrings set in platinum. • Mary J. Blige, nominee for Best Supporting Actress and Best Original Song, “Mudbound,” wore a Forevermark Exceptional Diamond cushion halo ring with split shank band set in platinum, 6.93 ctw. • Laurie Metcalf, nominee for Best Supporting Actress for Lady Bird, wore pendant earrings with old mine diamonds (11.0 carats), an Asscher-cut diamond ring (6.0 carats), and an Art Deco ring with a pink sapphire and diamond, all set in platinum. • Ashley Judd, a presenter, wore a Bvlgari necklace with diamonds circa 1930, set in platinum, and a diamond bracelet with diamonds circa 1939, set in platinum. • Helen Mirren, a presenter, wore $3.8 million worth of platinum jewelry by Harry Winston, including a necklace with a cushion-cut sapphire and diamonds (115.27 carats), and earrings with a cushion-cut sapphire and diamonds (25.22 carats), all set in platinum. • Kelly Ripa, a red-carpet regular who congratulated award winners with candy after their acceptance speeches, wore platinum by Fred Leighton, including a 19th Century old mine diamond Rivière necklace, and Art Deco old European-cut diamond earrings, both set in platinum. • Allison Williams wore platinum by Harry Winston earrings with diamonds and a bracelet with sparkling cluster diamonds, all set in platinum. Credits: All photos courtesy of Platinum Guild International.